Windows operating systems have built-in troubleshooting diagnostics that will allow you to detect the problems that you are experiencing with your network. 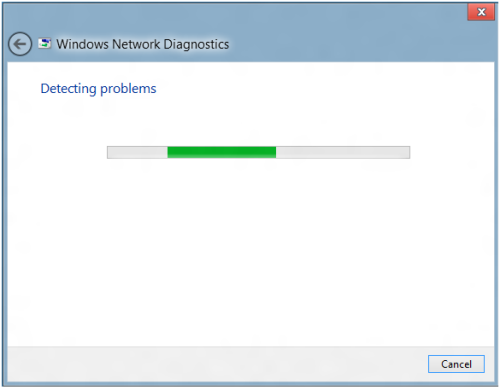 This article will show you how to repair Internet connection using the built-in Windows network diagnostics. Right-click on the connectivity icon on the system tray of your desktop. 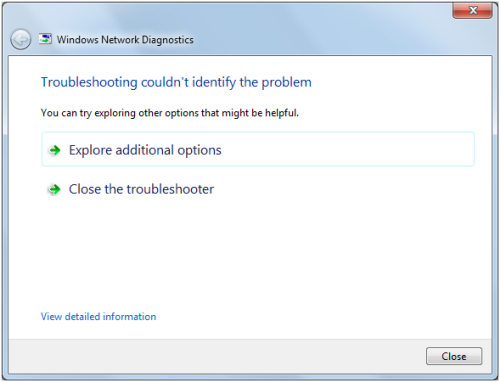 NOTE: Windows will now perform troubleshooting steps to fix your connection. Wait for the confirmation stating that the repair has been successful. 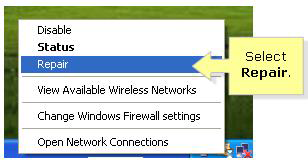 NOTE: For Windows XP users, you can connect to a wireless network using the Wireless Zero Configuration feature. For instructions, click here. 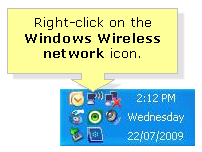 Right-click on the Windows Wireless network icon on your computer’s system tray. NOTE: Windows will now perform troubleshooting steps to fix your connection. Wait for the confirmation stating that the repair has been successful then click Close. To test your connection, you can visit different web sites using your web browser. If you can successfully access the sites, it means that the connection is working. Depending on the type of operating system that you are using, you may encounter an error message regarding the Network Diagnostics tool. 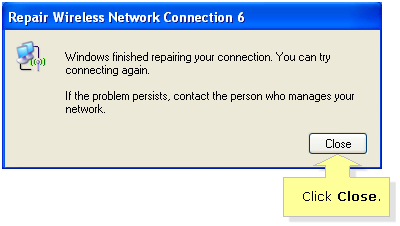 If you receive this message, it means that the tool was unable to fix the problems that were detected. You can click on the links below for other instructions in repairing your Internet connection.